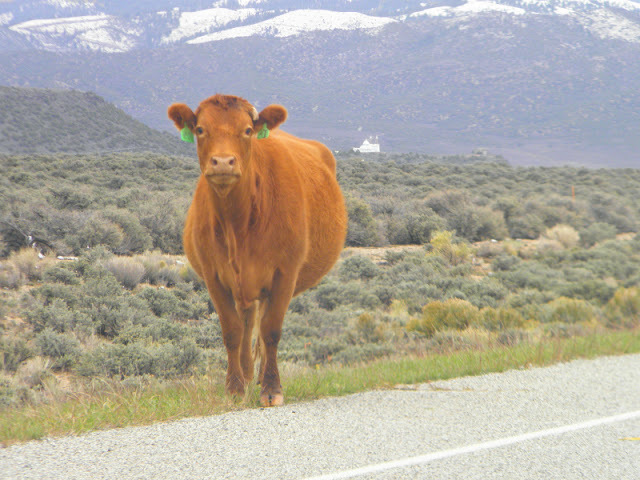 Los Alamos Daily Photo: Drive Carefully. They Are Watching! She looks like she is posing for you! Actually, she was "posing." We slowed down and then stopped to take pictures (little or no other traffic). When we did, she turned and checked us out. Imagine she thought us the rancher bringing some feed? I guess you could call these "free range" cattle. 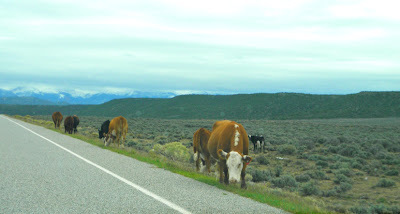 I don't the think the term "grass fed" applies - unless you count the grass that grows ONLY along the edge of the highway. I really like this shot! She's got pretty coloring that pops out with that background.